Derek Jeter became the 28th player in baseball history to reach 3,000 hits on Saturday, with a home run in the third inning at Yankee Stadium off the Tampa Bay Rays’ David Price. In doing so, Jeter became the first player in the Yankees’ storied history to reach the hallowed number. 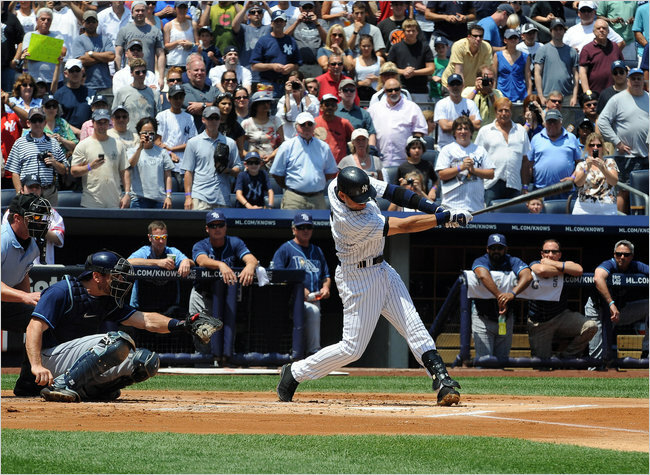 Jeter is the active leader in hits and the first player to collect his 3,000th since Craig Biggio of Houston in 2007. He is also the first to achieve the milestone at Yankee Stadium, old or new, and the fourth youngest player to do it. Only Ty Cobb, Hank Aaron and Robin Yount joined the club at a younger age than Jeter, who turned 37 on June 26. Jeter accomplished it all without playing anywhere but shortstop, the most physically demanding position on the field besides catcher. Only three other players, Honus Wagner, Cal Ripken Jr. and Yount, have recorded 3,000 hits while playing most of their careers at shortstop. Jeter is only the second member of the 3,000 hit club to hit a home run for hit # 3,000. The other player was Wade Boggs, who hit his mark on August 7th, 1999 while playing for the Tampa Bay Devil Rays.